A great first telescope and amazing customer service! I purchased this as my first scope after months of researching and i must say i'm over the moon with it! It is extremely portable and the views it gives are very pleasing even in light polluted areas. Jupiter has been my main entertainment having been out more than the moon since i got the scope, i have also had a faint glimpse of the Orion Nebula. 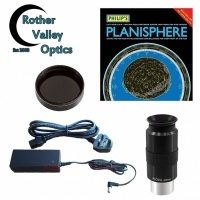 The folks at Rother Valley Optics are passionate about their work and the customers, Adam called me to make sure the dew shield and moon filter i purchased wasn't for this scope (which it was) as they were not compatible. This would have been an annoyance having to send them back but thanks to the great customer service i received the scope with the attachments and even a small refund for the price difference. Will definitely be continuing with this fantastic store! My primary scope is a 10" dobsonian, so it took some time for me to decide on a second scope. my concern was the reduction in aperture would leave me disappointed with the views against a scope with twice the aperture. However my opinion changed after first light.the view of jupiter is excellent and the orion nebula impressed me equally.planets are impossible to track with a dobsonian, hence my decision to get a guided grab and go scope. Iv yet to master the goto function, but my guess is that for a visual scope only it will certainly impress. The mount could be a little heavier, I wouldnt expect a stress free observing session in the breeze however. This is easily counteracted by having the mount set up at half height.and seemed to eliminate any vibration.also the eyepieces provided are very substandard.and would leave the observer dissapointed with their purchase as they dont utilise the scopes full potential.